Prof. Juozas Žilevičius, L. M.
Juozas Žilevičius has contributed to many areas of Lithuanian cultural life both in his native Lithuania and in the United States. He is an accomplished musician, a distinguished composer, teacher, organist, historian, musicologist, one of the organizers of the Lithuanian opera in Kaunas, Lithuania, a fine director and organizer of instrumental and choral groups, and, the organizer and curator of a vast collection of Lithuanian musical materials. 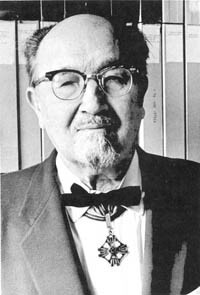 Juozas Žilevičius was born on March 16, 1891, in Lithuania. His musical study began with Napoleon Sasnauskas in Plungė where Žilevičius later became a choral director and organist of a large parish in 1908. The excellence of his musicianship and the quality of his choir became well known throughout the surrounding district in Lithuania. At this time he became well acquainted with the Lithuanian artist composer M. K.
Čiurlionis. Žilevičius heard Čiurlionis perform on many occasions and he also had many opportunities to speak with Čiurlionis. As a result of these discussions with Čiurlionis Žilevičius considers Čiurlionis to be his "first" composition teacher. During the summers of 1910 -1912, Žilevičius studied music in Warsaw with Vl. Lipkowski and M. Surzynski. At the outbreak of World War I he went to St. Petersburg where he became a music teacher at the St. Catherine men's high school. In 1915 Žilevičius was accepted as a student at the St. Petersburg Imperial Conservatory where he graduated in 1919 with a degree that is equivalent to the Master of Music degree. As part of his graduation requirements he had written a Symphony in F Major — the first symphony to be composed by a Lithuanian. Among his teachers at the St. Petersburg Conservatory were A. Glazu-nov and N. Sokolava (music literature), M. Karatigini (aesthetics, music history and style), Calafatti (harmony and accompaniment), Perova (wind instruments), Kubilinski, Vinogradova and Baranovą (piano), J. Vitolis. Zi-tomilski, M. Steinberg (music form and analysis), Cer-nova (orchestration) and Tcherepnin (score analysis). Žilevičius became well acquainted with the Lithuanian composer Česlovas Sasnauskas in St. Petersburg. After the death of Sasnauskas in 1916 Žilevičius acquired and popularized many of Sasnauskas' compositions. After Žilevičius received his diploma in 1919 from the Imperial Conservatory he accepted a position in Vitebsk. It was in Vitebsk that he acquired the rank of professor of music and taught musical courses until August of 1920. Žilevičius returned to Lithuania in 1920 and immediately became involved with Lithuanian cultural affairs. He became the administrator of the Kaunas theater and in 1922 he was designated by the Lithuanian government as the Minister of Arts. As a member of the Lithuanian opera council he was instrumental in organizing the first opera performances in Lithuania and also became one of the first conductors of the opera orchestra. He also taught at a Lithuanian art studio, a music school, and participated for three years on an archeology commission. As Minister of the Arts Žilevičius prepared and implemented a music and singing program for the schools and for three successive summers directed courses preparing music teachers. He also prepared a booklet for young singers which contained 100 songs using the D. Andrulis method. Žilevičius published this booklet in 1927. In 1924 Žilevičius was invited to become a faculty member of the Klaipėda music school. By 1926 he became the director of this school. During his stay in Klaipėda he organized a Lithuanian folk lore group and supplied funds for their activities. This group collected over three hundred Lithuanian folk instruments that were permanently displayed in his Klaipėda home. Among those who demonstrated these folk instruments were: Juozas Novakauskas, Juozas Narsutis, Alfonsas Mikulskis, Kazys Baltramiejus, Juozas Bertulis, Juozas Pakalnis and Jonas Švedas. The folk instrument collection was also exhibited in Kaunas and Tauragė and was known as the "Juozas Žilevičius Collection of Lithuanian Musical Instruments." In 1923 Žilevičius took the initiative to organize the first Lithuanian Song Festival which took place on August 23 and 24, 1924. In 1924 he published a Music Almanac that described the activities of Lithuanian choruses. During the summer of 1923 Žilevičius organized a symphony orchestra that presented 32 concerts. It was during one of these concerts that his Symphony in F Major was performed. Žilevičius chose a few of the more unique and rarer items from his collection and brought them to the United States. Instead of remaining three years he remained ten but was still unable to return to his homeland because of the outbreak of fighting between Germany and Russia. He was compelled to remain in the United States and later received word that the Germans had burned the town of Gargždai including the entire Žilevičius musicological collection housed with Canon Juozas Giniatas. Upon his arrival in the United States Žilevičius quickly became active in Lithuanian American cultural activities. In 1930 he urged that the Lithuanian Americans commemorate the 500th year anniversary of the death of Vytautas the Great. He was, elected chairman of the committee that planned the event and on June 1, 1930, in Carnegie Hall, he conducted a 500 voice choir in a song festival commemorating the anniversary. He also directed song festivals in many other Lithuanian centers during that commemorative year. He was also instrumental in organizing the Alliance of Lithuanian Parish choirs. Between 1932 and 1952 this organization presented an annual song festival. Juozas Žilevičius was always the director of the choruses. In 1939 the Lithuanian government had its own pavilion and Lithuanian Day at the New York Worlds Fair. On September 10, 1939, Žilevičius directed 60 choruses, consisting of about 3000 singers, at the Lithuanian Day festivities. In order to prepare for the event, Žilevičius visited and rehearsed each choir, separately, during the summer preceding the Lithuanian Day. During the 1956 American and Canadian Lithuanian Song Festival held in Chicago Žilevičius was the honorary conductor. He was the honorary chairman of the 1961 song festival that took place in Chicago and was a member of the 1964 New York Worlds' fair song festival repertoire committee. 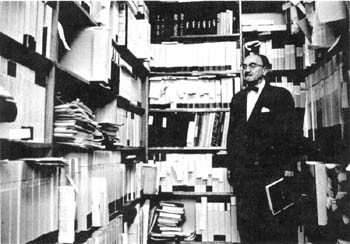 Prof. Žilevičius working at his desk in the Archive. The year 1920 is considered by Žilevičius as the year when the Lithuanian Musicological Archive was born. He brought back several boxes from St. Petersburg to Lithuania of items he had been collecting. When Žilevičius arrived in the United States in 1929 he greatly expanded his technique of collecting materials for his archive. At one time there were over one hundred co-workers and correspondents helping him in numerous Lithuanian American communities. Žilevičius has been successful in expanding the archives and replacing many of the items that were destroyed in Lithuania. Since Juozas Žilevičius was unable to return to Lithuania because of the outbreak of World War II, and, since his health was failing, he became concerned with the future disposition of his collection. He tried to find a temporary home for the archive at the New York public library, the Library of Congress, and elsewhere. In 1960, Žilevičius donated his entire collection to free, independent Lithuania. The musicological archive was accepted by the late former General Consul of Lithuania, Dr. Petras Daužvardis, as the property of free independent Lithuania. The archive was formally named the Juozas Žilevičius Library of Lithuanian Musicology. The official transfer and opening of the archive took place on October 5, 1960, at 2345 West 56th Street Chicago III., the home of the Lithuanian Jesuits in Chicago. About three thousand pounds of materials had been shipped from Elizabeth, N. J., the former home of Žilevičius. A committee was organized to oversee the operation of the library. Financial help became dependent upon donations from individuals and various organizations. Donated materials seem to arrive almost daily along with requests for photostats copies of materials housed in the library. It is difficult to comply with all requests because of the lack of help. Musicians and students have come from present-day Lithuania to visit the library for research materials. According to Žilevičius, who is partially blind, almost every visitor is surprised to find that most of the work of running the Archive is performed by him. This unique archive is probably the only one of its type in the world. Archive of Lithuanian Musicology in 1966. The earliest literary contribution written by Žilevičius appeared in 1908 in Viltis. His articles have also appeared in Šaltinis, Garnis, Rygos Garsas, and Lietuvių Balsas. In 1920 he was a member of the editorial staff of Menas (Art) and in 1924 he published and edited Muzikos Almanachas (Music Almanac). In 1925 he became the editor of Muzika, a publication of the Klaipėda Music School. In 1940 he became a member of the editorial staff of Muzikos Žinios (Music News). In Lithuania his articles appeared in Lietuva, Rytas, Baras, Skaitymuose, Švietimo Darbas, Gairės, Vairas, Židinys, Naujoji Romuva and Klaipėdos Žinios. Among the more important published articles by Žilevičius are the following: "Dainavimas ir muzika mokyklose" (Singing and Music in the Schools) in Švietimo Darbas, 1922-1926; "Spalvingumas ir M. K. Čiurlionis" (Color and M. K. Čiurlionis) in Baras, Nos. 9 -10., 1925; biographies and a lengthy article about Lithuanian music in A Dictionary of Modern Music and Musicians, 1924; "Muzikos dėstymo metodika" (Method of Teaching Music) in Muzikos Menas and Muzika, 1924-1925; "Liaudies muzikos instrumentai" (Folk Instruments) in Iliustruota Lietuva, 1927; "Muzikinė kultūra Lietuvoj" (Music Culture in Lithuania) in Židinys, 1935; "Native Lithuanian Musical Instruments" in The Musical Quarterly, 1935; "Amerikos lietuvių muzikos garsuose" in Naujoji Romuva, beginning in 1936; "Mitologinė lietuvių muzikos pradžia" (The Mythological Beginnings of Lithuanian Music) in Naujoji Romuva, 1936; "Kanklės mitologijoje, legendose ir tautosakoje" (The Zither in Mythology, Legends and Folk-lore) in Vairas, Nos. 7-8, 1937; "St. Šimkaus biografija" (Biography of St. Šimkus) in Margutis beginning in 1939; "A. Vanagaitis" a V. Alantas 1954 publication; "Mažosios Lietuvių liaudies muzikos bruožai" (Highlights of folk music found in Lithuania Minor) in Mažoji Lietuva, 1958. With V. Banaitis Žilevičius prepared materials regarding Lithuanian music for an Italian language encyclopedia published by Ricordi Co. 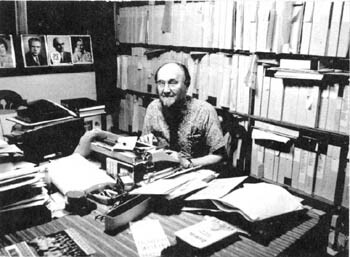 In the United States he prepared articles for the following Lithuanian and English publications: Draugas, Amerika, Darbininkas, Vienybė, Studentų Žodis, Ateitis, Lux Christi, Aidai, Dirva, The Musical Quarterly, Muzikos Žinios, Vytis, Varpas and Lituanus. He also was the music editor for the Lithuanian Encyclopedia published in the United States. Recently Žilevičius prepared biographies of Lithuanian musicians and composers for inclusion in the new edition of the German Riemann Musik Lexicon. Among larger publications are his biographies of Česlovas Sasnauskas (1935) and Antanas Vanagaitis (1954), Lietuvis vargoninkas išeivijoje (The Lithuanian Immigrant Organist), 1971; "Lietuvos muzikos vardynas" (A Dietionary of Lithuanian Musicians) published as a supplement in many issues of Muzikos Žinios; "Aušra ir lietuviškoji muzika" (The Dawn of Lithuanian Music) published as a supplement to Muzikos Žinios, 1957. Žilevičius still has several completed, unpublished manuscripts. Juozas Žilevičius has composed and harmonized about 400 compositions and about 300 of them have been published. It is noteworthy that the first symphony to be composed by a Lithuanian was written by Žilevičius. This Symphony in F Major had its premiere performance on July 27, 1923, in Kaunas, Lithuania, and was repeated later on radio broadcasts in Riga, Latvia, and in Kaunas. His instrumental compositions include a string quartet, an octet, Aušra (Dawn) for violin and piano, a march for orchestra and variations and fugues for piano. Beginning in 1920 two series of vocal solos with piano accompaniment and various choral compositions' were published in Lithuania. In the United States, his Cantata, Vytautas the Great, and operetta — Lietuvaitė, and religious music, using either Latin of Lithuanian texts, were published. His musical compositions, especially the choral works, are frequently performed. In his early works Žilevičius adhered to classical traditions, however, his later works, especially those written in the United States, reveal the incorporation of newer tendencies. All of his compositions are imbued with Lithuanian folk idioms. His original choral compositions and harmonizations of folk melodies show that he did not distort the flow of poetic lines even though he used polyphonic techniques. His instrumental and vocal works are sonorous, colorful, well-written and have a tendency to use flowing melodies incorporating a Lithuanian spirit. The Lithuanian government recognized the contributions made by Prof. Juozas Žilevičius by bestowing upon him the third order of Gediminas in 1935. * An illustrated brochure describing the general contents of the archive is published and available from The Juozas Žilevičius Library of Lithuanian Musicology, 2345 West 56th Street, Chicago, Illinois, 60636.